Every year, the most famous ghost, Frederick Fisher, is recognised in the infamous Festival of Fisher’s Ghost event. Right back to 1956, this ghoulish festival takes place over 10 days including a huge street parade, the Fisher’s Ghost Art Award, annual Fisher’s Ghost Fun Run, a massive street fair including craft exhibitions and a finale of carnival fireworks. Around four months after a local farmer (Fred Fisher), died in 1826 a very bizarre event took place at a local hotel. John Farley, a wealthy and well respected farmer, fell into the hotel in shock and claimed to have seen Fisher on the rail of a nearby creek bridge. The ghost pointed to the paddock down the creek and then vanished into thin air. Fisher’s body was then discovered in the paddock and he was buried in nearby St Peter’s Graveyard, with no headstone erected. Preparing now to be spooked, in 1825, Fisher was born in London yet obtained forged banknotes (intentionally?) and was sentenced to Australia for 14 years. Seven years later, he applied for a ticket-of-leave and moved to Campbelltown. Fisher had an argument with a local carpenter and received a mild prison wrap on the wrists. He gave his farm’s power of attorney to a neighbour, George Worrall, yet when he was released, Fisher disappeared. Worrall stated that Fisher returned to his native England but a few weeks later, Worrall sold Fisher’s assets. The town was dubious and eventually Worrall was arrested on suspicion of Fisher’s murder. Worrall finally confessed and he’s now buried overlooking Sydney Harbour by The Rocks. To celebrate Fisher’s life and Farley discovering him, the festival features a grim night of zombies, paranormal characters and enough spine chilling fun for all the family. Not only has the event launched great young music careers through showcasing but attendees can also be a winner, with Fisher Ghost competitions galore. If you’re attending, remember to pile on the gory red war paint or come as a freaky spirit. Maybe you’ll be a headless farmer or scare yourself into the next town from the outdoor cinema screenings, with movies horrifying enough to raise your blood pressure. 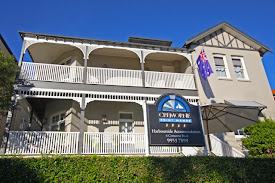 Just over an hour’s drive or a bone curdling 1.45 minutes by public transport from Cremorne Point, you can either spend the full duration at the festival or if your eyes are popping, head back to Cremorne Point Manor for a reality reset. You can see the Harbour from our hotel and possibly will want to check out Worrall’s grave. Ask him a few questions and see if the ghost of George decides to show his cowardly face. Also take photos of the famous creek, tagging @CremorneManor if you manage to spot Fisher. If you’re going to be spooked, we may as well join you in the paranormal fun of afterlife mystery!